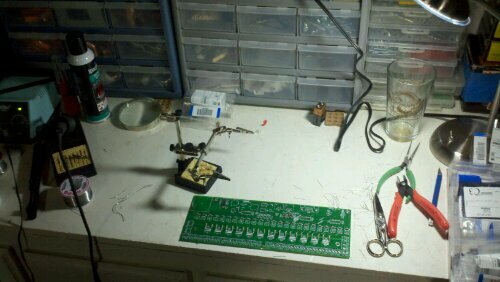 Tuesday night I was able to get started on soldering the Renard boardsw are starting with. I have two 24 channel boards giving us 48 total channels for now. I hope to buy at least one 64 channel controller with a group purchase between now and Christmas 2011. For now, here are a couple of pictures of the start. 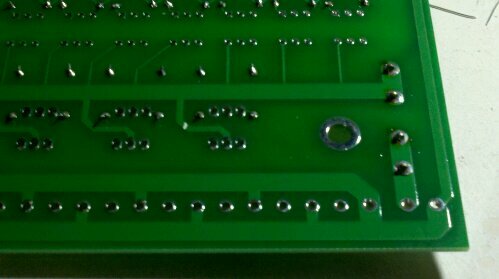 Since I’ve never soldered PCBs before, this was a new task. I already have a really nice soldering iron, but I bought a fine point tip, and some fine solder for this work. I actually found it much easier than I thought it would be. The fine tip, and accurate temperature control made it relatively easy. For now, I don’t have a PCB holder, so I would either put the board on my lap, my work bench, or clamp it with the alligator type clamps depending on where I was working on the board. 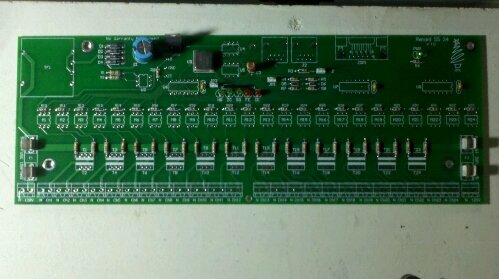 In about 3 hours I have all resistors, diodes, LEDs, caps, fuse holders, and IC sockets soldered to the board. I think all I have left are the triacs, RJ45, DB9 connectors, and the screw terminals. I should be able to complete those with another hour of work, then I can start tinkering with the software side of things. I will need to program the PIC microcontrollers, get some “tests” going with Vixen on a windows machine. Then I will start looking at the rs485 protocol and my own software to sequence/control the show. I don’t like the fact that vixen requires windows and hope I can easily “record” the output and convert to something I can plop into eeprom on an arduino or similar MCU. For now, I’m just excited to actually have hardware ready to play with. I will probably get a little “test” setup in the garage so I can visually see lights blinking and flashing. I spend a lot of time reading, learning, etc. on DIYC where I heard this gem: “It’s not a hobby. It’s an obsession. It is only a hobby for 6 months.” We’ll see if we make it past the hobby stage, stay tuned! Counting down to Christmas 2011 already! In the beginning planning stages. My hubby has taken on the task of putting together the boards and equipment to hook lights into, but I have been tasked with laying out and creating our light experience. If anyone has any outdoor decorations, lights or suggestions all are welcome at this point. Thank you! Welcome to ChristmasOnQuietHills.com. We registered this domain to document our progress of the Christmas display we have planned for 2011 and the future.